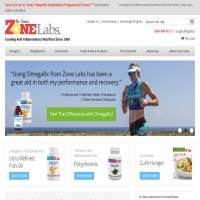 ZoneDiet.com offers a wide range of dietary supplements and products to help you stay healthy and nourished whilst trying to lose weight. It’s the brainchild of Dr Barry Sears, the author of The Zone (a NYT best seller). The Zone Diet is essentially an anti-inflammatory nutrition method which is designed around the concept that diet can affect the expression of gene traits. This includes weight gain or loss, and ageing. Being in “the zone” means that you have control over diet-induced inflammations, the effects of which are weight gain and sickness. Consequently, being in the zone, this site claims, can help you to lose excess body fat at a very fast rate, helps you to maintain wellness and feel good, improves physical and mental performance and slows down the rate of ageing. How can you achieve this? By controlling your diet. With the correct balance of foods, Dr Sears claims that you can stabilize insulin levels. It’s an easy-to-follow diet plan which requires you to maintain levels of Omega 3 (found in fish oils) and Polyphenols. Unfortunately, there’s not a great deal of content on the site. A lot of the information provided is somewhat vague, so you’ll need to explore the site in some detail to find what you’re looking for. There are a range of meals and recipes online, although there’s no search option so it’s hard to find what you’re looking for based on the ingredients you have in the house. You might therefore wish to purchase various books to fully understand the system and what you should be eating. The site provides a fat calculator and food journal, although there are very few other tools worth mentioning. You can also purchase Omega 3 oils and other products to help you on your weight loss journey. The site offers Zone Pasta, which is low in carbs, providing an alternative to conventional pasta, which is usually high in carbohydrates and so can lead to weight gain. With the exception of the recipes provided, DietZone.com does feel a bit like a storefront for various books and supplements. Its resources are limited and the advice offered online seems too indistinct to really provide expert insight. Whilst the theories behind the diet might be sound, the website doesn’t do a great job of explaining the diet in practical terms, or offering any kind of exercise advice. The Zone Diet might be worth a try. It seems pretty cheap generally and offers some healthy recipes to keep you on track. However, if you’re looking for more support, more variety and some help with exercising, you’ll need to go elsewhere.